For a number of years now, Adobe conducts a global survey to capture how people view creativity, it’s role in the their lives, it role in the business environment, etc. The most recent report - Adobe State of: Create 2016 - was published at the beginning of October and has many interesting findings businesses would do well to think about. The overarching theme is this: being perceived as creative can be quantified and turns out to be extremely valuable in terms of the bang one gets for the invested buck. It is our assertion that mobile apps is one of the most efficient ways of leveraging this. How much is creativity valued? 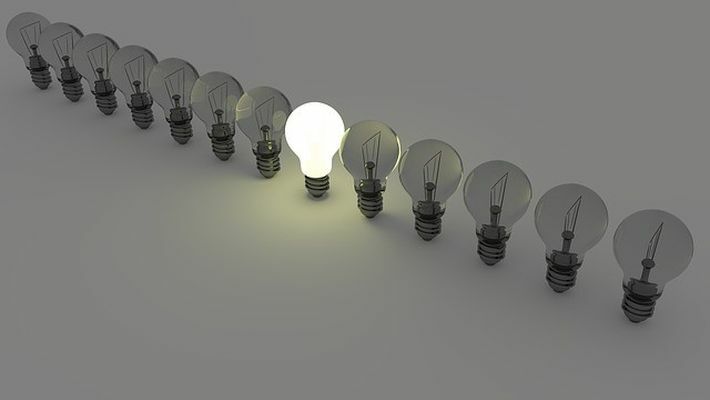 Both companies and people strive to present themselves it the best possible light; obviously, there are advantages to being perceived as hard-working, decisive or any other attribute that we think of as positive. Just how positively we tend to think about creative companies or people and creativity in general? According the survey, 70% believe that being creative is valuable to the society, ~70% believe that it makes us better as workers or leaders and 64% believe being creative is good for the economy. How do people perceive themselves in terms of creativity? Another interesting feature of this data set was the disconnect between our appetite for creativity and our perceived ability. When asked if they can describe themselves as being creative just 41% said they thought so and only 31% were able to confirm that they live up to their creative potential. This was slightly mitigated by age: younger folk (18-35 years old) tend to have a better opinion about their creative prowess: 48% vs. 38% (>35 years old). The fact that younger generations reported being more comfortable using technology to overcome their limitations when it comes to creativity may have to do a lot with it: 63% vs 49%. Is there an ROI for creativity? The fact that creativity is viewed positively is hardly any news. Can it be shown that creativity is objectively valuable? More difficult, but yes. Aside from being happier, more confident and more energized, people that self-describe themselves as "someone that creates" earn ~13% more in terms of income. 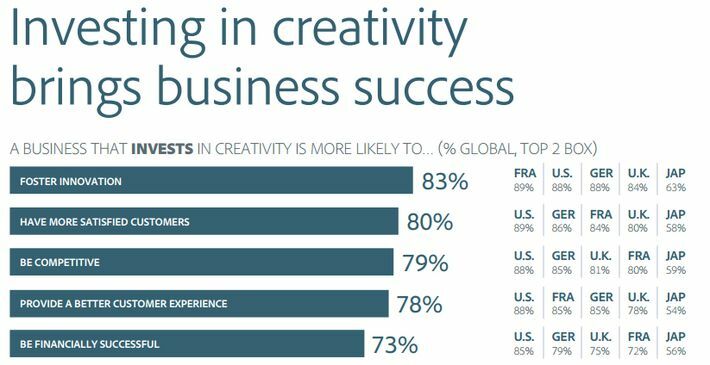 Further, when it comes to creative companies, there is a strong consensus (78%) among all respondents that investing in creativity increases productivity, increases customer satisfaction (80%), raises the quality of customer experience (78%), fosters further innovation (83%). What’s more, companies that invest in creativity are associated with a higher likelihood of being financially successful (73%)! Implications for you? Good design and creative marketing is your best bet! Ok, you will say, you’ve shown that creativity is good and that there are all kinds of benefits to being perceived as being a creative individual or company, but tell me what does that have to do with me? Perhaps you are already quite creative, but few notice it. Or, you think you are aren’t creative enough and you ponder what to do. We dress smartly when we want to impress and, to some degree, so do companies. How do you convey the idea that a company is creative? Even more importantly, what’s the surest yet least costly way to signal creativity to your target audience? The answer is this: some things signal creativity better than others; if you know which brings the best ROI in terms of generating a perception of creativity you will be obviously ahead of the cure. Let’s start from the basics. What do base your judgement on when you categorize a company, brand, product or service as creative? Your information is most cases is limited. You are not an insider. How do you decide that Apple is more or less creative than Microsoft? Or, how Facebook fares in comparison to Snapchat? One reliably stable indicator is... design! 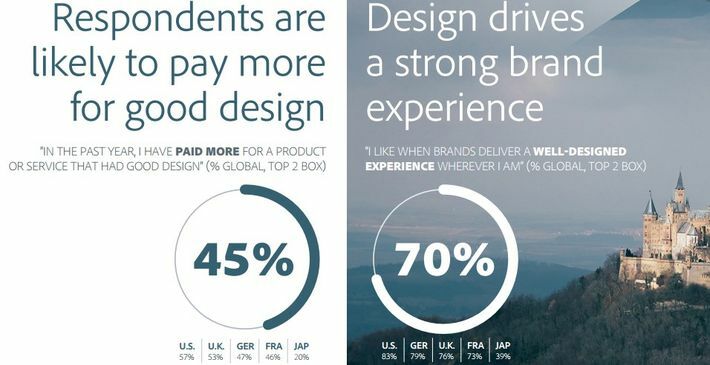 As you can see, Adobe’s survey captures very well the fact that, while there are exceptions and qualifications, a strong majority of respondents state clearly that good design is: a) very important (74%), b) its importance increased in the last 5 years (65%). More importantly, people are willing to pay more for a good design (45%), a good design is a very strong factor in branding (70%) and people consistently say that they are more inclined to shop from a business displaying creativity in marketing (55%). If and when faced with a choice between two competitors one of the most reliable factors that will influence the decision (59%) is again creativity under the guise of good design, as you can below. The same goes for brand loyalty: as many as 59% state that good design increases brand loyalty. Let me illustrate this with how Adobe - the publisher of this report - applies the insights on creativity and its importance to their website. Below is a screenshot that highlights what they optimized for when visitors look for them in Google search engine, as well as how many times creativity is emphasized on their homepage, both textually or visually. Unless you ignored the data presented above, by now you should be convinced that it is worth investing in being perceived as being creative and that good design definitely helps. Where do mobile apps come in? When asked to judge the statement "I will not purchase from a brand if its website or mobile experience poorly designed", close to half of the respondents (46%) indicated that they agreed with it. The US and UK respondents were the most intransigent when it comes to bad design with around 55% stating agreement! Both companies and people strive to present themselves it the best possible light; obviously, there are advantages to being perceived as hard-working, decisive, creative or any other attribute that we think of as positive, but they are not so easy to quantify. While we do not subscribe to the idea that perception is everything, neither are we blind to the fact that perception matters. It is a matter of common sense that the best image in the world will not hold for long unless it is backed up by reality. One simple way of ensuring this is to have a great online presence. It’s time to be creative!